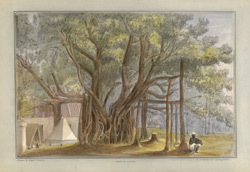 Coloured lithograph of a view at Jalna in Maharashtra by Rudolph Ackermann (1764-1834) after a drawing by Captain James Barton (1793-1829) from Barton's '12 Views of Hill Forts in the Western Ghats near Bombay' that was published in London c.1820. Jalna is a small town situated on the banks of the Kundalika river east of Aurangabad. The town is associated with the exile Abu-al-Fazl, the historian of the Mughal emperor Akbar (r.1556-1605) and was also used as a cantonment by the British from 1827 to 1903. A Banyan tree is placed in the centre of this view. The Banyan sends out aerial roots that embed themselves in the ground and in turn become new trunks.